Pebble is a porphyry copper deposit — the largest undeveloped deposit of its kind in the world. Don’t think in terms of nuggets, though. Ore from this type of deposit typically contains less than 1% copper by volume, sprinkled throughout the rock like fine grains of sand. Porphyry deposits form in areas where two plates of the earth’s crust meet and one slides beneath the other, creating what’s called a subduction zone. In this case, it’s the Pacific Plate (an oceanic plate) sliding beneath the North American plate. As the oceanic plate sinks deep into the earth, pressure causes it to melt into magma which then percolates up through the crust above. As the magma cools, elements like copper, gold and molybdenum precipitate out, creating deposits like Pebble. The Pebble Deposit is located in an ancient sedimentary basin known as the Kahiltna Terrane. The Deposit is estimated to be about 90 million years old, formed during the Cretaceous Age. The minerals themselves can be found in veins and within the granite-like rocks and wall rocks throughout the Deposit. The Pebble West portion of the Deposit is partially exposed at the surface, while the Pebble East portion is concealed beneath younger volcanic and sedimentary rock. The 1964 Good Friday Earthquake, centered beneath Alaska’s Prince William Sound, was a seminal moment in our young state’s history. At a magnitude of 9.2, it was the second largest quake in recorded history. There’s no denying it: Alaska has earthquakes. In fact, it’s the most seismically active of all the United States. Today, the level of seismicity at Pebble is relatively low but Pebble wouldn't even exist without this kind of geological activity, which created the Deposit 90 million years ago. 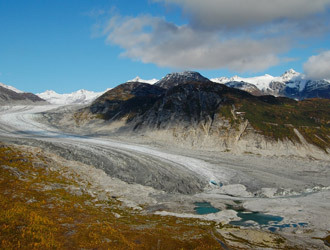 The Pebble Deposit is located over 15 miles from the mapped extent of the Lake Clark fault, a westerly fork off the Castle Mountain fault system that runs beneath Anchorage and up the Mat-Su Valley. The Castle Mountain system is active, geologically speaking; it experiences movement approximately every 700 years, and may be due in the next 50-100 years. However active the greater Castle Mountain system may be, according the USGS, all geological evidence suggests that the Lake Clark fault hasn’t shifted or shown any signs of activity since the end of the Ice Age, over 11,000 years ago. And regardless of how unlikely future activity may be, Pebble engineers will design mine site and other project facilities as though the Lake Clark fault were active, to ensure they will withstand the maximum earthquake potential for the area. Alaska is a land of volcanoes, situated on the Pacific Rim along the so-called Ring of Fire. The Pebble Deposit itself is at the end of a long chain of volcanoes that comprise the 1,600 mile-long Aleutian Peninsula. Sometimes, eruptions can interfere with air travel, but generally we’ve learned to live with them. Mounts St. Augustine, Iliamna, Spurr and Redoubt are the four active volcanoes located roughly 50 to 100 miles or more away from the Deposit area. The nearest volcano to the Pebble site is Mount St. Augustine, an island volcano in Cook Inlet’s Kamishak Bay about 60 miles to the southeast. It’s currently in an active phase, and could erupt at any time. What would this mean for Pebble? Very little. Work could stop for a while, of course, due to poor air quality, ash cleanup, and so forth similar to what the city of Anchorage has experienced with past eruptions, but the operations and facility itself are unlikely to be affected. Precautions would be taken to protect employee health and safety and make sure that essential equipment continues to work properly. Have you heard of Novarupta? It was the largest volcanic eruption of the 20th century, and it happened just 150 miles from the Pebble site. At least, it was centered there… Novarupta’s 20 mile high ash cloud drifted half-way around the world, darkening skies as far away as Africa. Novarupta began erupting on the morning of June 6, 1912 and didn’t stop for three days. By the time it was done, it had spewed 30 cubic kilometers of ejecta across the Alaska Peninsula. It erupted so much that it drained Mount Katmai’s subterranean magma chambers, causing its summit to collapse into an 800-foot deep, 2 mile-wide pit. A fine volcanic ash rained down across the region, accumulating over a foot thick in places, suffocating people and animals and causing structures to collapse under its weight. It could happen again. It very probably will happen again—vulcanologists have identified at least seven eruptions of a similar magnitude that happened in the last 4,000 years—within a 500 mile radius of Anchorage. Why is this important? A century ago, an incredibly violent natural disaster took place on the Alaska Peninsula. You can still see the geological evidence, of course, but ecologically, you probably wouldn't know it happened. The ecosystems of today’s Bristol Bay, Iliamna Lake, Kodiak, the Kenai… that’s what you get in the aftermath of an eruption that was 30 times the scale of Mount St. Helens.